In the mid-19th century, English gamekeepers needed some serious help to deal with poachers, so they developed the Bullmastiff from a cross between the Mastiff and the Bulldog. The Mastiff was large but not aggressive enough, while the Bulldog was brave and aggressive but lacked the size and speed to knock down and hold a man. The cross of these two breeds created a dog that was not only enormous, but also fast and canny enough to sneak up on the bad guys. They usually didn’t attack the poachers, just pinned them to the ground until their master arrived. This popular cross became known as “The Gamekeeper’s Night Dog,” and they worked and lived alongside the gamekeeper and his family. Smart, fearless, reliable and confident, these large and powerful dogs make excellent companions. 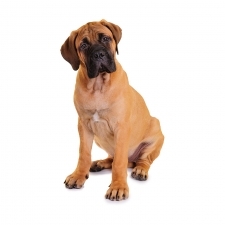 Bullmastiffs can be your best friend as they are loyal and protective. They are faithful, sensitive, intelligent, and eager to please. Bullmastiffs are very good with children and are very protective of them. They are natural guard dogs and can be territorial to a fault, so they don’t always get along well with other dogs. Bullmastiffs were bred to be silent watchdogs, but will bark loudly if there is a threat. Bullmastiffs usually weigh between 100 to 130 pounds and stand approximately 24 to 27 inches tall. They have a large build that is muscular and massive. They have a very short coat, and the color of the coat comes in solid red, fawn or brindle, with a black muzzle and black around the eyes. Bullmastiffs slobber – a lot! They shed little and only require minimal grooming. They are prone to heat exhaustion and heatstroke and should be kept indoors during hot or humid weather.